White Canvas Syndrome? – Uh huh! | Tezi Mag ~ Grab A Coffee, Read, Relax, Enjoy! Amused were we and ever so delighted to have been contacted by an art student who read our article Got White Canvas Syndrome? He googled the term ‘White Canvas Syndrome’ because he believed his art teacher had simply made the expression up. BUT – Oh yes! It exists alright and is the bane of every artists creative realm, at one point or another. White canvas Syndrome (or White Page Syndrome) is an AGE OLD problem for both artists and writers; white page syndrome for writers, white canvas syndrome for artists. The trick to solving this problem for an artist, is to always JUST START PAINTING. Put a splat on your page with paint, draw a line – it doesn’t matter – break the white and make that mark! (Or – do what our Tezart Artist suggests; paint the entire canvas first and see what imagery pops out of the mix of undercoat colours; a trick and technique she garnered from her number one favourite fantasy artist, Mr Roger Dean himself ) The second trick is – NEVER be afraid of stuffing it up – don’t NOT do something because you’re afraid it won’t work. There are no such things as bad painting or drawing marks – just some marks that work and some that don’t; the ones that don’t – you expand into something that does! Always work INTO a mistake – turn it into something. Don’t erase – in constantly doing this you not only slowly and assuredly erode your own confidence in the artistic and creative abilities you have, but you will also surely become an obsessive perfectionist who will constantly erase and re-work everything to the point of distraction. You will amazed what can come out sometimes if you go WITH a mistake and see what you can make out of it. Be bold and confident and your works will shine, shy away from the canvas – and you will never get a piece finished to your satisfaction – ever! Make a splash! 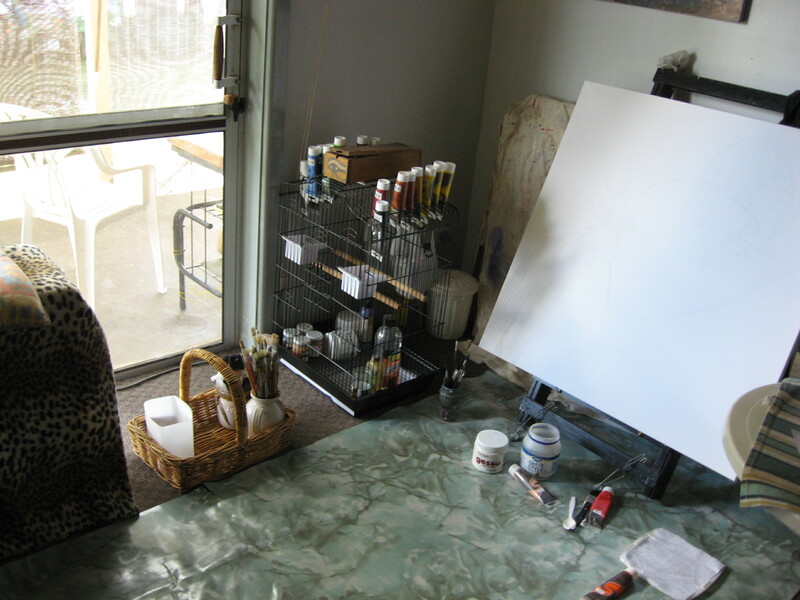 ← PAINTING FOR PASSION–OR PROFIT–?